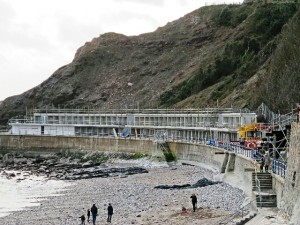 A picturesque Devonshire beach front has undergone a stunning transformation – and Liniar doors have been used as part of the ambitious £1.6m development. 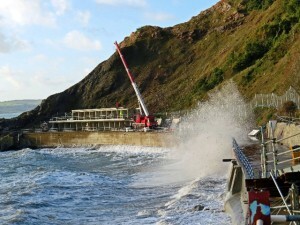 A survey revealed that the existing single-storey, 50-year-old beach huts and chalets at Meadfoot Beach, Torquay, were beyond economic repair. 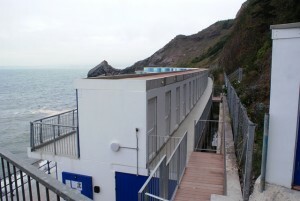 Torbay Council contracted construction firm Interserve with the task of demolishing the old huts and replacing them with a modern complex. Headquartered in the UK, Interserve have offices in Europe, Asia, Africa, the Middle East and the Americas, and is one of the world’s foremost construction companies. A successful international business offering advice, design, building, and frontline public services, they have gross revenues of £3.3 billion and a workforce of approximately 80,000 people worldwide. The scheme involved the huge logistical challenge of installing pre-cast concrete units in areas with restricted access. 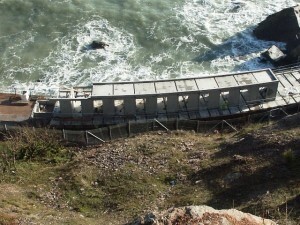 The design successfully aligned the new development to the sea wall, creating a tapered effect that fits in with the cliff backdrop and pine-studded cove. The two-storey complex of 144 luxur y chalets has an upper tier with private balconies and are fitted with an electricity supply, kitchen worktop and cupboards and will be available for use throughout the year. 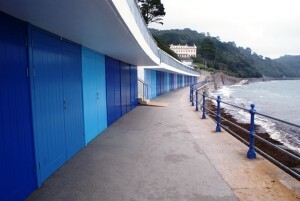 As part of the design for the project, double French uPVC doors were specified for each beach hut. After working closely with Interserve on previous developments, Exeter glazing manufacturer Harmony Profiles Ltd were awarded the contract to provide and install the doors. A family-r un business with more than 25 years of experience in supplying to residential and commercial clients, Harmony is a leading specialist in the manufacturing of bespoke architectural aluminium glazing products – but not uPVC. “As a preferred contractor of Interserve we were delighted to take on this project. But as the main focus of our business is aluminium, and uPVC was specified, we had to do our homework in regards to what brand of doors to use. 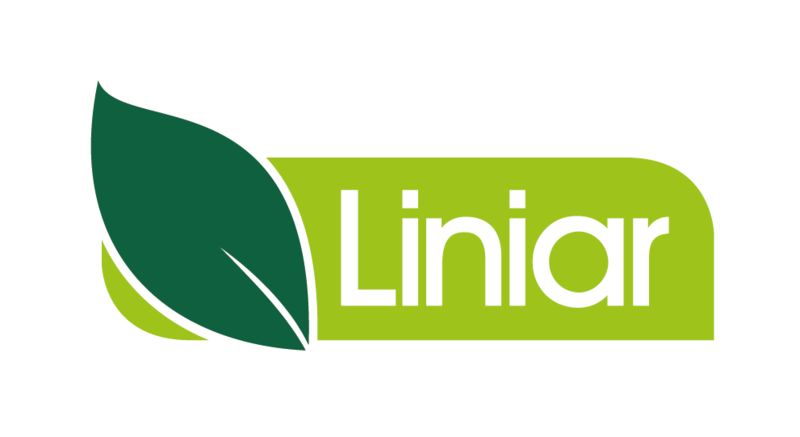 Liniar fabricator Omega Trade Frames, based in Kinsteignton, Devon were contacted and engaged to supply the doors for the whole project. Formed in 1995 and one of the South West’s leading manufacturers of uPVC trade frames, Omega operates from 10,000 sq ft purpose built premises with a capacity to produce 800 frames per week. “It’s th e first time we had dealt with Omega and we were very impressed with them and the quality of the doors,” says Ross. “Our fitters loved the product. They were simple to install and we couldn’t have asked for better usability and workability. 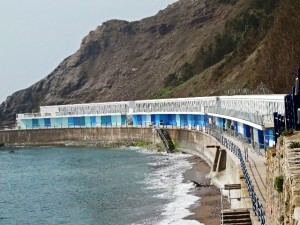 The superior thermal efficiency provided by the Liniar profile was vital for the location of the beach huts as they are designed to be in use throughout the year. 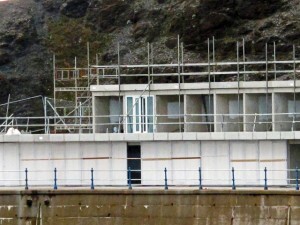 Harmony began work on-site with a tight deadline to have all 144 beach huts fitted out in just three months – and despite some inevitable delays caused by the weather the assignment was completed ahead of schedule. 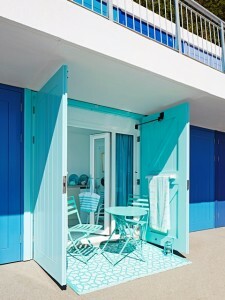 Once all of the doors had been fitted, hardwood shutters were installed to provide protection and, painted in 15 different shades of blue, create an attractive finish. There is a now a waiting list for the much sought after beach huts, which are available to rent at annual costs ranging from £1,340 to £2,060. For more information on Omega Trade Frames click here. Click here to find out more about Harmony Profiles Ltd.
For more information on Liniar French doors click here.